movies@ Hemingways is home to the biggest big screen movie experience in the Eastern Cape. Come to movies@ Hemingways and enjoy the latest blockbuster movies from Hollywood in comfort. 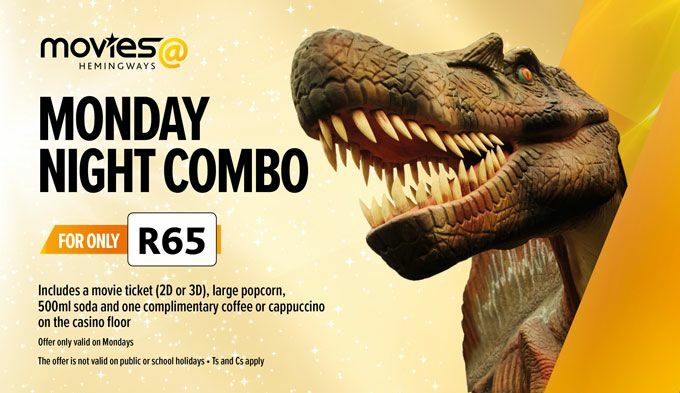 So put your feet up and enjoy your popcorn in a relaxed and spacious setting at one of the leading cinema’s in the Eastern Cape. Use your Rewards card and enjoy great discounts starting at 30% off your tickets. At movies@ Hemingway’s - the best cinema in East London - we have recently upgraded 6 cinemas, 3 in 3D and 2 in 2D. Our largest cinema shows in spectacular 3D, seats 296 people and boasts the largest movie screen in the Eastern Cape. Kindly note that movies@ Hemingways uses Dolby 3D glasses only. As a Rewards Cardholder you get from 30% and up to 60% off the normal movie ticket price (depending on your status). Valid 7 days a week. Sign Up to the Rewards Programme now. It’s easy and it’s free!